Building your new home in Perth is an exciting progress, but when it comes to choosing exterior elevation colours in the pre-start room, you will most likely get overwhelmed by all the options. To help give you some direction, I chat with Kara, a professional Colour Consultant from Ventura Homes. 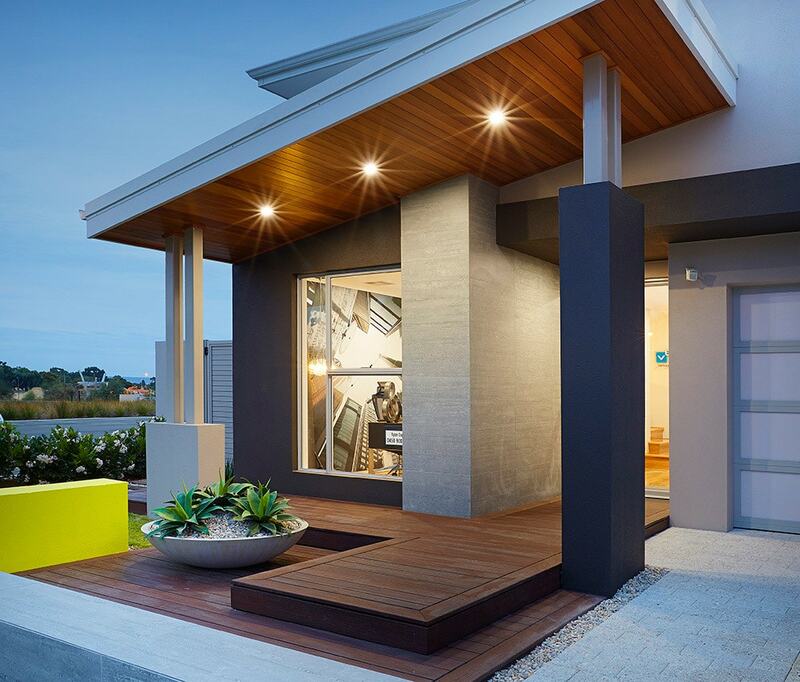 Kara lends her knowledge and insight into the colour choosing process, what colour schemes are currently trending and what her favourite Ventura Display Home elevation is. Kara, why is it so important to be mindful of the exterior colours you choose? The exterior materials and colours of your home are an expression of your personal taste. It is important to carefully consider your choices and make sure you will be happy with them in the long-term, as it can be difficult and costly to change things once your house is built. I always encourage people to have a look around at homes that they like, and don’t like, to ensure that the decisions they make about the exterior of their home are well considered. It is also important to be aware of any design guidelines/restrictions that may apply to the area you are building in, as this often affects the materials and colours you can choose from. What are some hints for choosing exterior elevation colours? I think it is important to establish, firstly, whether you like light or dark colours and warm or cool colours, as this will give you instant direction. Once you have established this it is easier to focus on just the colours that suit your preferences. I also think it important to have contrasting colours to add interest to your exterior. For example, if you have a dark roof you might like to consider a lighter gutter and/or fascia colour, which can help to define your roof line and create a break between your roof and render/brick colour. It can also be helpful to decide on a style or theme that you would like to draw inspiration from when making your exterior selections. Newspapers, magazines and blogs are always a great source of inspiration. What colours have been popular for the exterior this year? When it comes to exterior elevation colours, I have noticed a lot of people embracing white, greys and charcoals. Also, feature stone cladding is one upgrade that a lot of people are adding to their front elevations. The Archistone decorative feature stone panels (stack stone) that we offer are a very popular choice for this. Although a fully rendered frontage (generally two render colours) is the dominant trend, I have seen some creative use of face brick as a feature. 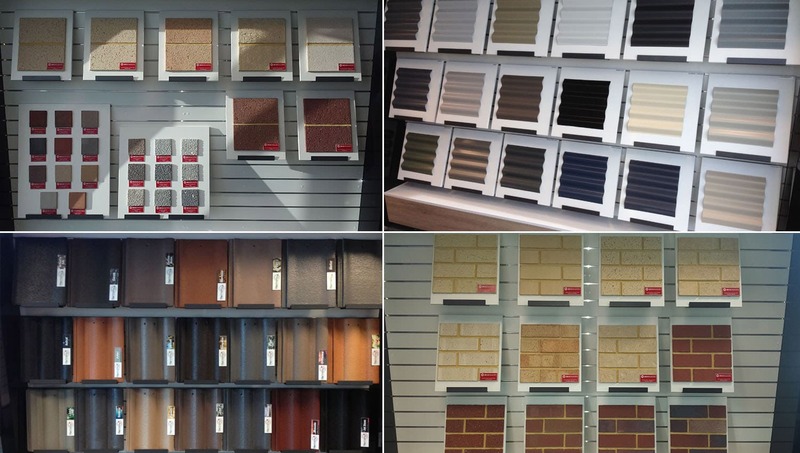 For example, Brikmakers Vintage Red face brick (1 Course) is a unique brick that can make a great impact for a front elevation when used for a blade/feature wall and paired with a darker colour palette. What are three exterior colour schemes that are current and popular at the moment? 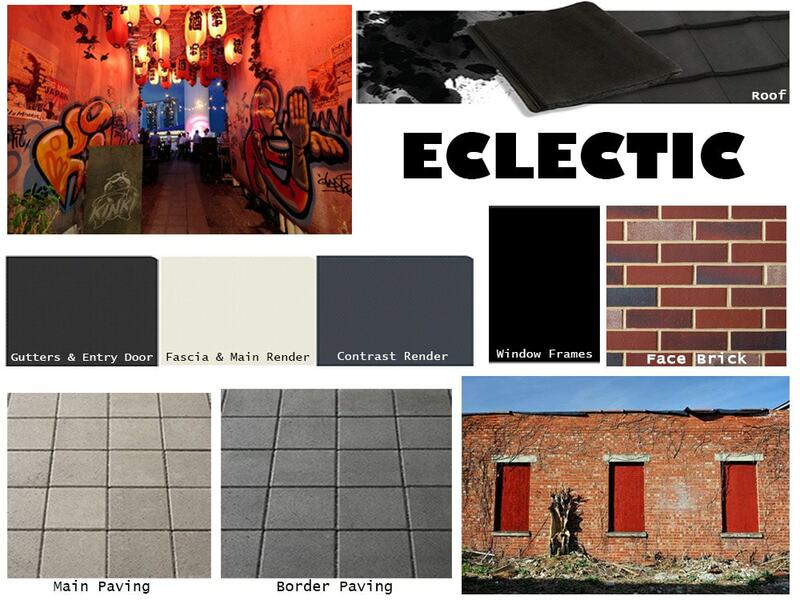 Coastal, Ecletric and Warm & Cosy schemes are what’s really popular right now for exterior elevation colours. 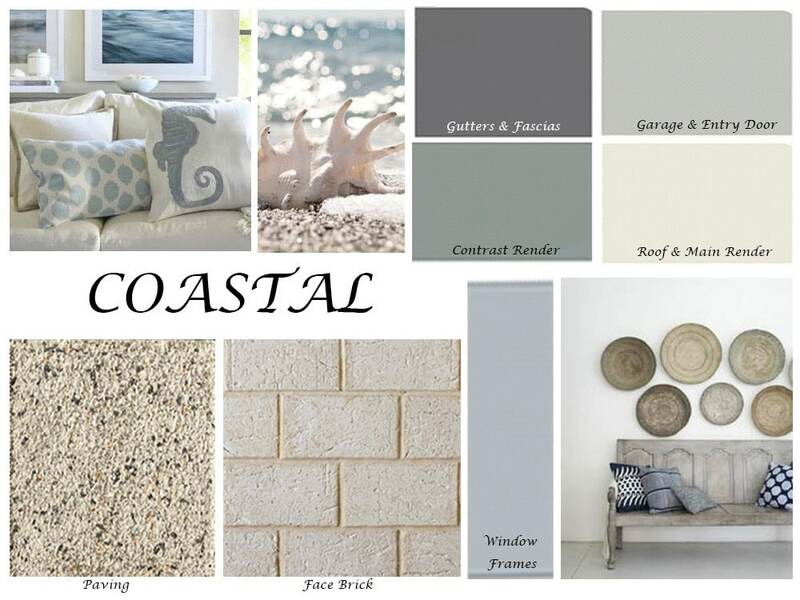 A white base teamed with soft greys and blues creates a cool and fresh look well-suited to ‘beachy’ themed homes. An edgy look can be achieved by combining a bold colour palette of white, black and deep blue with a vibrant red face brick. 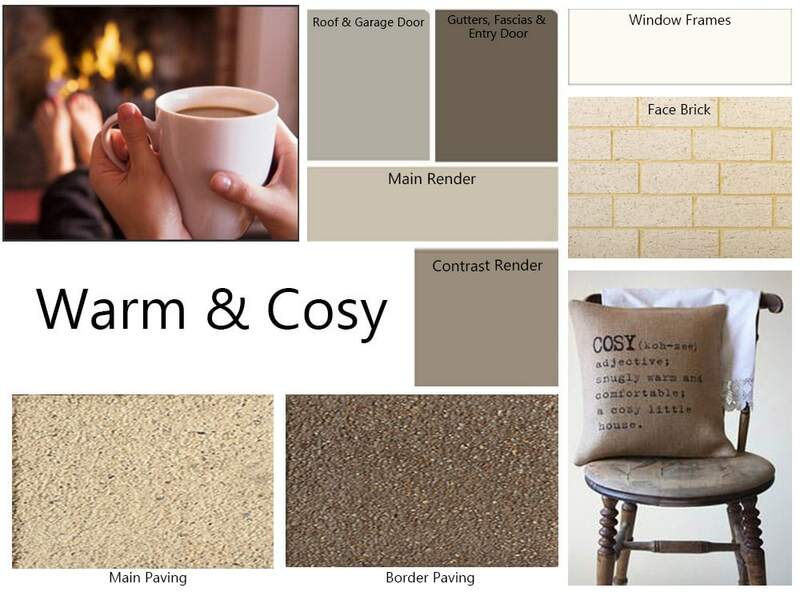 Warm tones in chocolate and coffee colours are always inviting and a very popular choice for many homeowners. Lastly, what is your favourite Ventura Homes elevation? 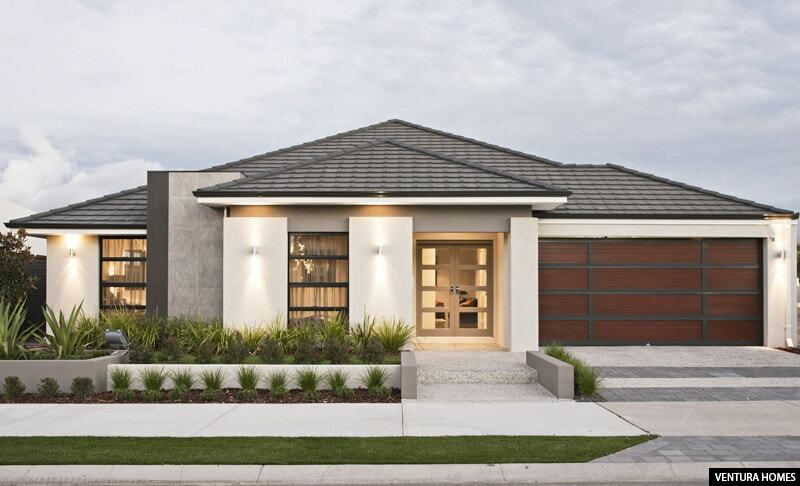 My favourite Ventura Homes display home, as far as the exterior goes, would be one of the newest Ventura displays – The Monterosso, in Waterford. The use of an accent render colour to the front elevation is very refined, and establishes a theme for further accents within the house. For this house the accent is a canary yellow, but it could be any colour the homeowner likes. Together with a neutral and modern colour palette of silvers, greys and charcoals the colour palette is striking and sophisticated. I also love the Jarrah eaves on the skillion roof of the portico and the timber-look decking below to add an element of warmth to the front elevation, this could also be achieved by adding a timber entry door or timber-look garage door – which are common upgrades for homeowners that I see. For more information about building with Ventura Homes, click here to contact us.